Well it's masculine card time at the CAS-ual Fridays Challenge. The timing is great actually, it is my brother's birthday in a couple of weeks so this will be his birthday card. I also going to put this in the Simon Says Stamp 'Fathers Day/Special Male' Challenge. It's funny how the most simplest looking cards are not that simple. This is a great looking card!!! Great masculine card Tracey! The blue, gold and white look fantastic together! Awesome masculine card! The colors are great! Perfect masculine card, Tracey! Simple but just perfect. Love it. Thanks so much for playing with us @ CAS-ual Friday! 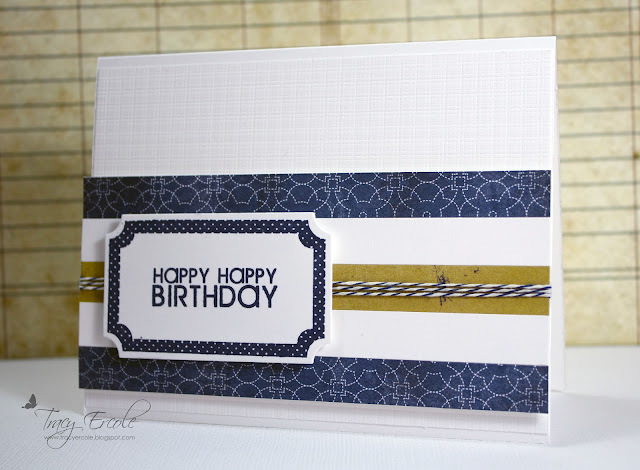 Love the color combo Tracy, wonderful card! Absolutely PERFECT! Love how CLEAN your card is! Thanks for playing along with us at CAS-ual Fridays!